4. and inconvenience of any sort whatsoever. A dachshund who is able to inflate himself by 800% on a rainy night? Of course! 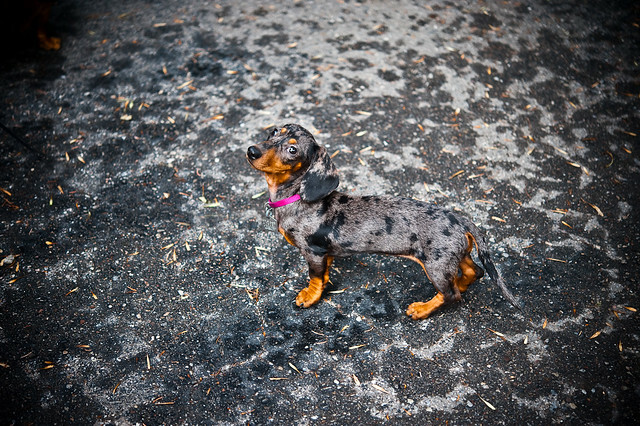 He's a member of the Elite Dachshund Special Ops Team referenced about fifty posts back. It's not a natural ability, but one achieved through a combination of selective breeding, genetic modification, intensive training, and heinous fuckery. Little Hawk, what's this I read on another thread about a dachshund being able to inflate himself (his specific gravity?) by 800% on a rainy night? Have you published on this topic? Seems to me that in an incredibly important discovery in the world of physics. And possibly in veterinary medicine. What??? Again???????? Aw, fer Chrissake! What will North Ontario DO without him? Boy, the smell must have been...just awful. LH, Shame McBride was killed a few hours ago in a tragic accident at Tim's. He apparently grabbed for a doughnut that was still in the fryer, slipped, kicked a rather nasty "biker chick" in the ankle, and she upended him into the boiling grease. The OPP are investigating, but it appears at this time that it is being treated as a "regrettable, but fortunate, accident" and no charges will be made. The grease in the fryer had to be discarded as it was considered "too filthy now" for continued use, according to a spokesman for the doughnut chain. Noble words, Amos! With you around to defend civilization, I need never fear that decadence, ignorance, and sloth will achieve anything approaching total victory. So, go to Tucson and swing north a little bit and come visit. Eiseley'll put you up if she's sober enough, or you can stay at our place. Mudcatters criss-crossing the country. I see the Getaway thread passing up and down the screen these days. I have another trip to Tucson soon, but no further west. I use the weed whacker to clear the grass growing through the brick patio out back. MOM can pull a chair over there and enjoy breakfast if she wants. Is anyone making muffins or croissants tomorrow? Drop a few by for her, please. I left her some yogurt and fresh fruit. The fly swatter isn't for the flies - it's to keep the dogs out of her breakfast zone. She'll have to eat fast if she's out there.